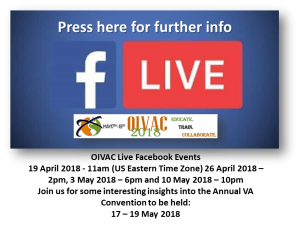 Welcome to the Online International Virtual Assistant Conference (OIVAC) for 2018. As a VA we are very busy, with OIVAC we can attend the conference and work at the same time, with this being an online conference, if you can multitask and have double screens. Or you can run the OIVAC conference via your mobile phone while working on your computer or laptop, also even having it playing on your iPad or Tablet. There are +-40 speakers who will present at this years conference. Speakers who are leaders within their Industries and for their subject knowledge. When the speakers are speaking you can ask questions in the online chat and the speakers will either answer them as they are presenting or at the end of the presentation. The Speakers very often give you fantastic tips and advice along the way, they are minds of information and they don’t mind sharing their knowledge with you. This is knowledge you can take and apply immediately in your work. The conference is very interactive. 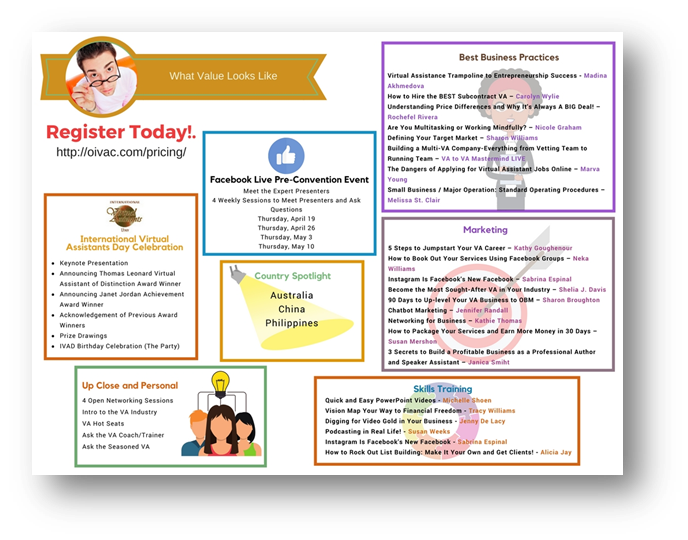 Do you want more clients – find out how to get more clients at OIVAC 2018. Do you need to improve your skills – find out how at OIVAC 2018. Want to learn more about the VA Industry – attend OIVAC 2018. If you’re in Australia, China and Philippines, wherever, it doesn’t matter. You’re all invited because we’re LIVE, and VIRTUAL, and this convention runs 16 hours each day. Buy your ticket now and catch our Early Bird Special. Join us, celebrate your industry and your business, and connect with peers while participating in a unique VA learning experience. Mother’s Day is coming soon, attending the OIVAC 2018 would be the idea Mother’s Day gift. OIVAC is the event where VAs from around the globe gather to celebrate our industry’s growth and development. EVERYBODY’S INVITED! There will be presentations to VAs chosen by their peers to received the Janet Jordan and Thomas Leonard Awards. An event not to be missed.